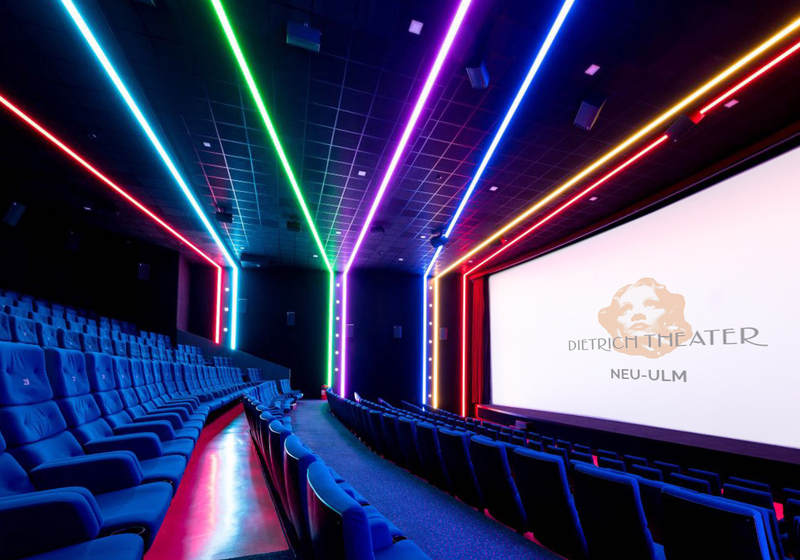 Neu-Ulm Germany (September 21, 2018) – The demands of moviegoers are growing – and with them the pressure on cinema operators to enable ever better and increasingly immersive cinema experiences. Dolby’s surround sound technology Atmos is one of the most sought-after features in the cinema market, and is often integrated into a larger premium concept. Such a premium concept was realized by the two Munich companies ZweiB and Videocation in a joint project in the 363-seat Saal 8 of the Dietrich Theater in Neu-Ulm, Germany. In the course of very extensive conversion work, Videocation was responsible for the installation of a Sony SRX515DS 4K double projection, while zweiB took over the installation of the equally high-quality sound system. “The customer clearly opted for a premium concept and, in addition to the absolute high-quality state-of-the-art picture quality, also wanted an outstanding sound installation,” recalls Tammo Buhren, managing director of zweiB GmbH. “ZweiB actively supports Alcons as an innovative loudspeaker manufacturer, which we believe offers the best possible quality sound available on the market,” said Buhren, explaining his confidence in the Dutch company’s products. The installation of the sound system in the cinema 8 of the house was completed within a week. The result convinced the operator so much that already a few months later a second, identical installation, apart from the lighting concept, was commissioned in hall 9, which was successfully completed the following months. zweiB installed 5x Alcons CR4 3-way Pro-Ribbon screen systems, 4x CB362 subwoofer, 2x CB181sl subwoofer surrounds, 18x Pro-Ribbon CCS12 surround sound systems, and 4x CCS12S and 8x CCS8S as top surrounds. The entire system is powered by Alcons Sentinel3 Amplified Loudspeaker Controllers.